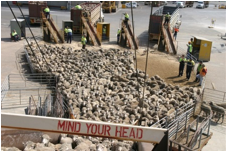 Minister Joyce wants everyone in the country to believe that record high prices for livestock and an ever-increasing demand for wool are the beginning, as one journalist put it, of a ‘golden era’ for the farmers of Australia. Coupled with what some are calling a record harvest, what could possibly go wrong for Minister Joyce and the wheat farmers of Australia? Well this for starters. According to two reports published many months before the recent claims of agricultural bliss and euphoria, a highly qualified team from AEGIC reported to Australian wheat growers that there are dark storm clouds on Australia’s wheat industry horizon, storm clouds, which, the reports conclude, demand the immediate attention of the wheat industry. The AEGIC is an initiative of the West Australian Government and Australia’s Grains Research and Development Corporation (GRDC). The reports when they were released did not, as far as I can determine, receive the attention they deserved from the media. Perhaps this publicity will cause others to ask why? 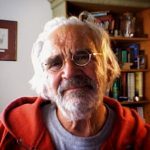 Both reports have not, as far as I am aware, been the subject of the attention and comment by our Deputy Prime Minister or any of the wheat industry acolytes and heaven help us, members of the National Farmers Federation and State Farm Organisations who hang around the halls of power. Both reports raise serious questions regarding the future viability of the Australian wheat industry — I suspect they have been ignored in the halls of so-called power for that very reason — nobody wants to face the facts. I have done my best to convey in a few pages what Prof Kingwell and his colleagues from AEGIC have diligently researched and recorded in hundreds of pages. Some may disagree with my views and/or may disagree with what is contained in the reports. These pages are open to anyone to ‘state their case’. The first thing to do is set aside the time to read the reports. Said a doctor to soldier after amputating only one of his legs. Anon. Current world wheat prices are the lowest for more than a decade Millions of tonnes of Australian wheat, which cost more per tonne to grow than its present value on world markets, which unless sold at prevailing prices or on a contract negotiated before wheat futures crashed, will remain in storage waiting, hoping for world prices to improve. Many growers will not be able to afford to wait; their lenders will force them into selling their grain at current market prices because ‘after harvest payment terms’ means just that — payment after harvest. As many of us know the trading banks haven’t built their reputation of recent years on compassion. Some budgets will fall short on income this year; others will be a train wreck. What started out to be a season of considerable promise, potentially the best for many a year, turned into a patchwork of the good, the bad and the ugly. I recently harvested my 64th wheat crop and produced more bushels this year than any other year. Many Kansas farmers have had the same experience. Because of record yields, most people will assume this is also a good financial year for wheat farmers. Unfortunately, the low price will not cover the cost of production for most farms. The national average cost to produce an acre of wheat in 2016 is $315.78. The projected national average yield for 2016 is 50.5 bushels an acre. At $3.45 average price a bushel, national average income per acre is projected at $174.23. That is 55 percent of the cost of production. We deserve better. Full story. Leo Olivia is a Kansas historian and author who lives in Woodston. Professor Ross Kingwell, Chief Economist; Mr Peter Elliot, Manager — Strategy and Market Analysis; Dr Peter White, Supply Chain Specialist and Dr Chris Carter, Economic Analyst, all from AEGIC, have diligently, thoroughly and forensically researched and written two reports, which compare the costs of grain production from paddock to port in Ukraine and Russia with the same costs in Australia and in one case Canada. From the reports, I have concluded that this has not been an exercise in desk-top research, but that the authors have been on the ground and have first hand experience of the markets and countries in question. Australian wheat growers are fortunate to have reports of this quality — if they fail to act on their own destiny, they will have no one to blame except themselves. Ross Kingwell in a video on the same subject says several times that he does not see the future (after considering the Baltic States) as a ‘black hat’ affair as far as Australia is concerned. I have a great admiration for the work of Ross and his team — but I do not share Ross’ opinion or guarded optimism on the future. The story they tell frightens me. It frightens me because they show that one of the Achilles heels of the Australian wheat industry is not the cost per hectare — but yield per hectare. In the last twenty years or so most of the world has increased its wheat yields at rates far and above those achieved in Australia. The other heel is also in poor condition so the wheat industry is quite lame. It is quite evident from the research that Australia and Canada are hopelessly uncompetitive with our grain supply chain costs. It’s ugly, but the numbers are there and cannot be argued. It is time the heavily levied Australian wheat grower asked ‘why?’ Why has the rest of the world (ROW) left us behind when it comes to increasing wheat yields and why has the infrastructure required to get the Australian crop from farm to port been allowed to deteriorate to the extent that it is so expensive that it is no longer world competitive. The costs associated with getting crop from farm to port in Australia is a disgrace. Australian wheat growers need answers. Here is the evidence we are being beaten on yield. The ROW has been beating us with a big stick when it comes to increasing wheat yields per hectare. In 1961 according to the United Nations Food and Agriculture Organisation (FAO) the world average wheat yield was 1.4 tonnes per hectare, in 2013 it was 3.8 tonnes, an increase of 171%. In Australia during the same period yields increased from 1.084 tonnes to 2.137 tonnes per hectare an increase of just 97% — half of the ROW. (The AEGIC reports mention Australian wheat yields as an average over time at 1.82 tonnes/ha, the FAO figure was from the last year recorded. The trend lines are in the FAO report. For continuity and to avoid confusion we have accepted the AEGIC figure of 1.82 tonnes/ha as the Australian average yield). During the same period wheat yields in America increased from 2.522 tonnes to 7.367 tonnes per hectare, an increase of 192%. In the United Kingdom and most of the EU during the same period wheat yields increased from ~ 3.177 tonnes to ~7.707 tonnes, an increase of 142%. Peruse the numbers at your leisure. You will be surprised who has been beating us neck and crop when it comes to increasing wheat yields, it’s all here. If I can find these statistics, what have our policy makers (read politician’s researchers) State Departments of Agriculture, the CSIRO, the Universities and so many others who earn a living via levies on agricultural production been doing while Australia has been falling further and further behind the rest of the world in increasing wheat yields? The answer, by the evidence in yields, appears to be nothing. Are the varieties our growers use capable of better yields but our growers don’t know how to achieve them meaning that the problem is agronomic? Whatever the reason we are where we are and no body, apparently, saw it coming. I have written in the past about the decline in Australian wheat yields since the nineties and my observations have been met with a stony silence. My observations were justified because in the 1970s farming just inland from Geraldton and operating a two to three year direct drill, clover, wheat, barley rotation and for a lot of the crop we only needed superphosphate and a top up with urea if warranted, we had a five year wheat average ( 80% Gamenya) of just under what is now the national average. I’m not bragging, just asking why? Why have we not progressed? We ran a lot of sheep. We managed clover pastures like crop paddocks. We controlled weeds in crops and pastures. That all happened over forty years ago. National statistics show that the average Australian wheat yield continued to increase until the 1990s. Is it a coincidence that the decline started ‘about’ the same time as the wool crisis and so many found the excuse they had been looking for to get rid of their sheep and buy a bigger tractor and get serious about cropping and fishing? The AEGCI reports show very convincingly that Russia and Ukraine have the capacity and the real potential — not an economists ‘whiteboard’ theoretical potential, to push Australia aside in the world wheat market because they can grow and sell a tonne of wheat cheaper than Australia. The rest of the world is growing more wheat per hectare and so there is increasing competition to sell wheat those countries, which cannot grow all the wheat they need — like Egypt and Indonesia, two of Australia’s ‘traditional’ markets. While Australia was still harvesting the Baltic States sold hundreds of thousands of tonnes of wheat to Egypt for about US$189 tonne landed Egypt which is approximately A$257.50 tonne. Does this mean that wheat breeders and growers around the world are the first to meet the challenge of feeding a world population of 9 billion in 2050? Probably. The UK is talking about re-opening the worlds biggest wheat-to-ethanol plant, which can gobble up a million tonnes a year. A lot of wheat goes into meat production destined for human consumption. The indications are that in the future the world won’t be short of cereals but, ironically, short of animal protein. The world ever increasingly wants more meat and less grain for human consumption. Once upon a time Australia was good at keeping sheep, it had the biggest and the best flock of sheep in the world. Australia bred excellent meat sheep and held the priceless intellectual property of the best merino (wool) genetics in the world. Then if you remember, forecasters came along and convinced the sheep keepers of Australia that there was and never would be any money in sheep for meat and wool was finished because we had pushed the price of wool too high for the market. So, together with the rest of the world, we ate the sheep. And worse still we ate irreplaceable genetics. 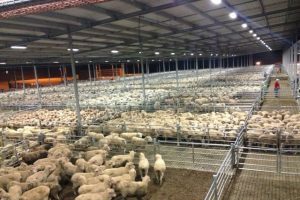 We now have the same number of sheep in Australia as we had in the 1920, and in WA, the numbers continue to decline they have gone from about 36 million to about 12 million. Those same forecasters convinced Australian farmers that Australia was growing enough food to feed another 60 million people and the world was waiting for more food and farmers believed them and grew more wheat. Nobody mentioned the rapidly escalating cost to grow a tonne of wheat in Australia compared to the rest of the world. We saw it in our bank balance though, but we didn’t pay any attention because money was there for the asking. Not even the lenders compared income to debt; but then why should they, they were the lenders. Why are our leaders silent? Rural debt and gross value of farm production per dollar of debt. If any politician has read the reports, which I am discussing in this article, they have chosen, as far as I am aware, to refrain from any public comment — that doesn’t surprise me, for to have commented would have been to admit that they were aware of the potential if not the reality of a crisis in Australian wheat growing that could change the face of agriculture in Australia. At the start of 2017 Rural Debt in Australia is growing again and it is currently just under $70 billion. The worry is the right hand axis on the graph, gross value of farm productivity per dollar of debt. The trend may well be up over the last few years due to livestock prices, now we have low grain prices to reverse that trend. What other conclusion is there that Australian farmers have subsidised their production and their standard of living by borrowing more and presumably reducing their asset equity. The authors of the two reports from which I quote have asked that ‘Export and import values often vary depending on the information source — exercise caution when interpreting information presented in this publication.’ I ask for the same consideration. I have, of course, commented on the reports. I have not changed any of the statistics. I am both the messenger and a commentator. My objective is to start a debate that must happen and happen soon. This is the price that Australia has to compete with to get back a ‘traditional’ market, Egypt. Remember this is US$ converted today ~A$250 per tonne not including freight. Jan 18 Agritrade. There is talk in the international wheat trade that prices for wheat will remain depressed for at least another year, maybe two. If those predictions are true and international world winter wheat plantings show no signs of declining, there are more tough years ahead for Australian wheat growers — the big questions will be whether they will be able to manage the challenge of their costs being greater than their returns? Having said that nothing is certain in this world — some are forecasting that planting will be down in the United States, but as history has shown us with the march of yield increases, a decrease in planting (area) may not affect the volume and so the price. It’s fair to say the future is volatile. Australian wheat farmers can still claim, on a per hectare basis, to be the most cost efficient wheat farmers in the world — so what? It’s a claim that means nothing. We don’t sell wheat by the hectare we sell it by the tonne. A glance at the table below shows that Ukraine can produce a tonne of wheat for a little over half what it costs to produce in Australia. That is a worry for which there is no short-term answer for the Australian grower. According to the authors of two reports from the AEGIC, Ukraine and Russia are alarmingly more efficient than Australia when it comes to producing and transporting a tonne of wheat, not just to port, but to many of our traditional markets. They are more efficient than us because they produce nearly twice the yield per hectare that we can produce in Australia. Take another Bex because I haven’t finished — they have the potential, almost whenever they want — and they will get the money to do it, to considerably increase their current yields and expand their growing area by millions of hectares — all of this on some of the most fertile soils in the world. Their potential to expand, to increase their annual production is bigger than the current Australian wheat harvest. If their winter wheat crop is affected by severe weather, usually temperatures so low the wheat is killed, then all is not lost for the Ukraine and Russian farmer, once the soil temperatures improve they can plant a short season cash crop, the most popular being sunflower. In the report on the Ukraine the flexibility of crop options is discussed and the values quoted. Basically it means that winter wheat growers will not have a growing season failure. If the winter wheat fails they have the time and the resource to plant another crop. Below are just some of the statistics that appeared in one report from the AEGIC in 2016. There was some media coverage at the time the report was released. The Australian agricultural media is not economically savvy. It would sooner report on organics than economics. So we missed out on the economics and few may have been converted to organics. This story on Ukraine should have been headline news. It was probably the most important story on the Australian wheat industry for decades and was forgotten within days. Compare the recent fall in the price of wheat to the fall in the price of iron ore and then compare the potential for social dislocation between the relatively few employed in the iron ore industry and the millions living in rural Australia who rely on the wheat industry to kick-start their economy and we gain another perspective on rural Australia and its importance to the fabric of life outside the majesty of the big city. When Australia’s richest woman buys a cattle empire that is national news. When the Australian wheat industry faces a potential crisis, the story doesn’t get to or maybe to be kind ‘past’ the editors desk. Which story is the most important to the economy of Australia and more importantly rural Australia? The media decides because the media doesn’t understand. The two reports are small books in size. They demand attention when being read. They contain information vital to the future of wheat growing in Australia. These are the production costs comparisons that at the beginning I said I found quite frightening. One reason I found them frightening is obvious, both Australia and Canada have a problem with supply chain costs. 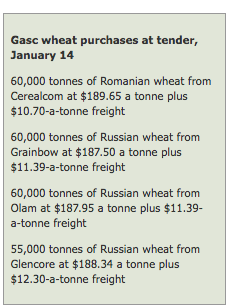 We can now see why the Baltic states could afford to sell wheat to Egypt for about A$257 a tonne. According to the AEGIC reports that’s cheaper per tonne, than Australian farmers can grow wheat and get it to the port. This means that only the blind and the deaf, and we are neither, have any excuse to ignore the threat the Baltic States present to the Australian wheat industry. The time has come to get down off our high horse and do some serious strategic thinking. Do not dismiss this as a seasonal one off. America, also facing this competition, recently matched the Russian and Ukraine prices in an unaccepted tender to supply Egypt. This means America is prepared to flex its export subsidy muscles if it has to. President Clinton said about American agriculture — ‘We will not let the heart of America die’. Neither, apparently, will Trump—because it was the rural vote that got him the keys to the White House. Previous PostAustralian Wheat is too Expensive – Interflour. Next PostConvincing evidence – Short of a miracle, the Australian wheat industry is terminal.